Does Montero Have A Future With Mariners? The Mariners shipped Jesus Montero to Tacoma in May, then he was injured, now he’s facing a 50-game suspension. What’s his future? Vote here. In an ideal world, Jesus Montero would be blossoming for the Mariners, as are Nick Franklin, Brad Miller and Mike Zunino, into a productive major league player. But Montero’s career, which flew off the tracks in May when the Mariners demoted him with a .208 batting average, and took another hit when he suffered a torn meniscus in his left knee, reached nadir Monday. Along with a dozen others, Montero received a 50-game suspension from Major League Baseball for his connection to the Miami-area Biogenesis clinic. Ex-Mariner Alex Rodriguez (1995-2000) took a landmark 211-game blow, which he appealed, allowing him to play with the Yankees while an arbitrator determines his fate. Montero began the 2013 season as Seattle’s starting catcher, and one of its brightest prospects. He made Baseball America’s top prospects list four times from 2009-12. Last year, as a rookie, Montero showed a bit of promise as a hitter with a .260/.298/.386 slash line, although not much as a catcher. 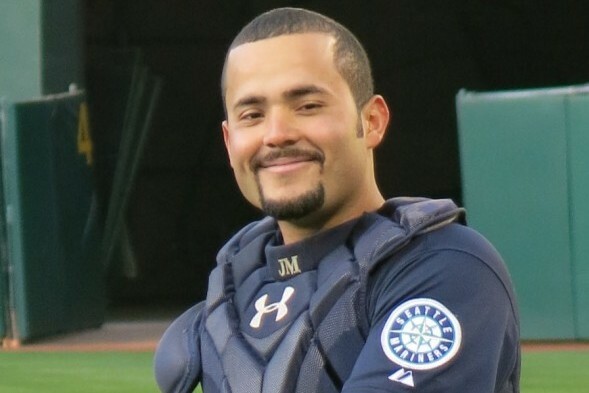 Last February, Montero officially became linked to Biogenesis, but the issue quickly ebbed into the background as the season began and as the Mariners hoped he would develop as a slugger and catcher. Didn’t happen. By May 20, Montero was hitting .208/.264/.327 in 29 games, necessitating a demotion to AAA Tacoma so he could begin the transition to first base, a move made inevitable by his poor play behind the plate and Zunino’s rise in the system. But after just a week with the Rainiers, Montero suffered the knee injury and underwent surgery, sidelining him until July 5. When he returned to the Rainiers, after a rehab stint in Arizona, Montero played 19 games and hit .247/.317/.425 before the Biogenesis shoe dropped. With Kendrys Morales and Justin Smoak covering first base and DH and Henry Blanco and Humberto Quintero serving as adequate plug-ins behind the plate for the remainder of the season, Montero’s Tacoma performance suggested he did not have much hope of returning to the Mariners this season. Now he has none, as this season is lost for the 23-year-old. At 23, Montero can still salvage his career. But whether he has any future in Seattle remains to be seen. Please take our poll and let us know how you feel. Absolutely. Look no further than Michael Morse who has also been suspended then traded away. Then brought back. It’s up to Jesus. He can’t let himself get down, he has to take the approach of “I’m going to prove people wrong” and then just do it. Montero can’t come back if he can’t play a position. There’s not a steroid in the world potent enough to get him from home to first before curfew. That’s how it worked for Bonds. Most fans don’t care enough to stay away. The ones who care are the clean players, who finally have the union’s attention. And the teams are the ones rewarding players after the 50 games are up as if nothing happened. It’s quite a dubious coincidence how far and fast Montero’s numbers took a dive since his name turned up in the BioGen case. Could just be the mental overload of being a 23 year-old in the midst of a major league scandal. Ultimately, it’s up to his coaches to determine if his power was real or ‘pharmaceutically’ augmented. But either way, his only hope in the majors was to be a slugger; he’s too slow to be anything else. And I’m not very keen on a player who’s that one-dimensional unless his OPS has a 1 before the decimal point. Montero has no position but DH, and that spot usually goes to an older vet on a one-year deal. He’s played and doped himself out. Overweight, slow, doesn’t play any position defensively. The only way Montero will make it is if he’s the second coming of Edgar Martinez. Hard to believe the M’s gave up a prime trade chip to get a player with so many shortcomings. Actually, it’s not that hard to believe. Where the Mariners are concerned, nothing is hard to believe. It’s on the players and their union. Through their union they can work with MLB to get the cheats out of the game. Surely the clean ones are being victimized by those taking chemical shortcuts. If they don’t take a stand against it nothing will be done. The union should work for the vast majority of players who do it the right way and not to provide support and sustenance for those who cheat. No question that Montero’s in tough and it’s his own fault for letting Alex Rodriguez play the Pied Piper while Jesus played one of the lemmings. But, as Art says, if he comes back and suddenly starts hitting, he’ll be forgiven. As long as the DH rule exists, there will always be room for sieve-gloved slugs in baseball as long as they can swing a bat. Seems Seattle fans have already lionized such a hitter from the past.